Sunday, November 11, during the EquipHotel trade fair, Pascaline Lepeltier won the competition of the Best Sommelier of France 2018, succeeding Gaëtan Bouvier, sommelier in Lyon, France. In front of an audience of 800 persons, five high-class candidates met in the finals for the title of the Best Sommelier of France 2018. Florian Balzeau, Pascaline Lepeltier, Isabelle Mabboux, Pierre Vila Palleja and Aymeric Pollène offered the spectators an excellent performance. Each of them has brilliantly highlighted the profession of sommelier that demands many qualities, both human and technical. All along the five workshops (Tasting – Food & wine pairings – Service – Beers – Coffees and Spirits), Pascaline Lepeltier clearly stood out. 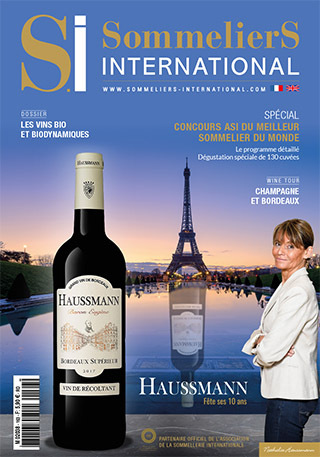 After the title of One of France’s Best Craftsmen in Sommellerie in 2018 Pascaline has become the first woman to win the competition of the Best Sommelier of France*. A double victory for the 37-year-old lady who has been given the trophy by UDSF president Philippe Faure-Brac. This 11 November will certainly remain in the history of the French Sommellerie. Based in New York for 10 years Pascaline Lepeltier, native from Angers, flawless career and a long list of distinctions. Though Pascaline Lepeltier first chose philosophy, she quickly turned to wine. She started at L’Auberge Bretonne as cellar manager, and one year later she already became Best Young Sommelier in Loire wines and UK Sommelier of the Year. In 2007 she joined Rouge Tomate, a Belgian network of restaurants specialized in healthy cuisine with spots in Brussels and New York. In 2009 she has been appointed Beverage manager of the flagship restaurant of Rouge Tomage in Upper East Side, New York, and settles there. Considered as an advocate for natural wines by Food & Wine Magazine Pascaline Lepeltier is also known for her commitment to Loire wines for which she has become a wonderful ambassador. On the strength of her commitment and passion for wine, she passed the exam of Master Sommelier in 2014, thus become the 21st woman holding this title. Now Pascaline Lepeltier teaches at the Court of Master Sommelier and at the Institute of Culinary Education in Manhattan ; she has recently partnered with the Racine restaurant in New York. Her energy, charisma, knowledge and total mastery of all the duties of the profession enabled Pascaline Lepeltier to win the prestigious competition of the Best Sommelier of France. A victory she dedicated to Gerard Basset, 2010 Best Sommelier of the World. We warmly congratulate the winner for her achievements as well as all the candidates for their participation and their commitment! *1978: Danièle Carré-Cartal won the title of Best Restaurateur-Sommelier of France followed by Maryse Allarousse in 1980. Fifteen new members of the Union received the famous golden bunch during the celebration of the thirtieth anniversary of the creation of this title organized in Bordeaux.